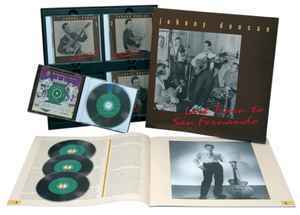 1-16 –Johnny Duncan & The Blue Grass Boys* Which Way Did He Go? 4 CDs & 28p book in hard box. Booklet includes long bibliographical essay including interview material and photos. Discography by Paul Pelletier with John Cowling & Richard Weize includes detailed recording locations and personnel for each track. The discography listing is chronological. The presentation of the tracks on the CDs are roughly chronological.